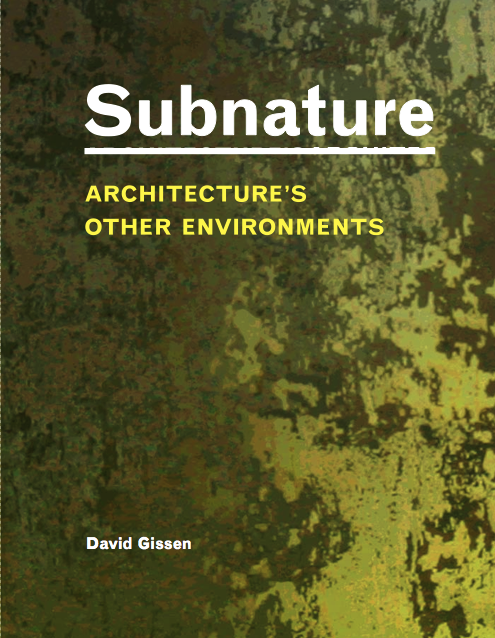 Subnature: Architecture’s Other Environments goes to press next week. I can confidently say that it’s going to be one of the most provocative books in the “nature” section of your bookstore/architectural bookstore/amazon list. 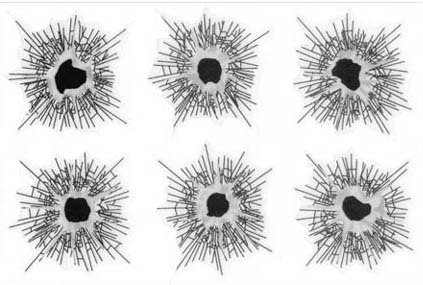 What do the following three, illustrated spreads from this book have in common? Check out Subnature, better yet, BUY Subnature and find out! Now that Subnature is done, I would like to take a break (! ); but timing is such that I’m in the midst of developing a forthcoming issue of AD — Territory: Architecture’s Geographical Operations. Final confirmations of authors are pouring in; and some new friends/colleagues will be joining the mix, which makes me very happy. We have a great line up planned, and I will be posting more information about the issue soon, including a description and some work samples. I am impressed by these images of Robert Moses’ Lower and Mid-Manhattan highway proposals reconstructed (or I suppose in this case constructed) into google maps. It’s a form of experimental historical practice (we like that), and it always strikes me when someone goes to the effort to produce something like this. The author of these can be found here. I do wonder why one would choose google maps to make these. 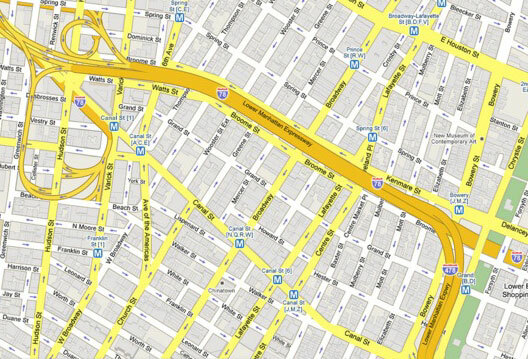 Perhaps google maps is the objective language of the present. 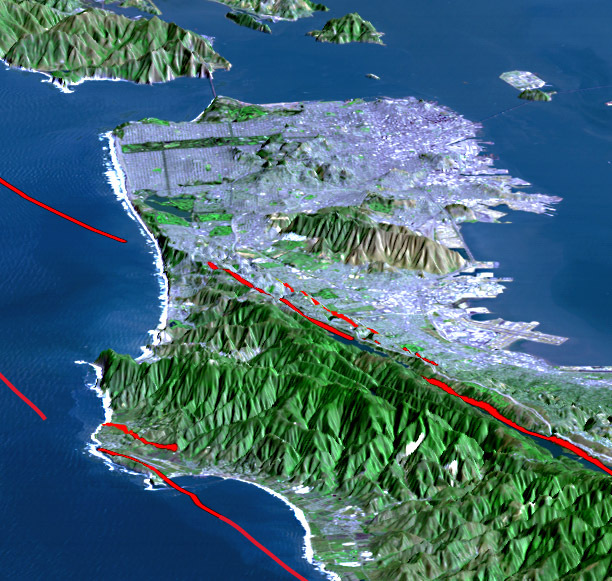 It’s what a city looks like now (versus an aerial photograph, a birdseye view, a Bollman map). But the potential problem with this and other google map reconstructions is that it places the historical projects of the past into the uniform language of the present. 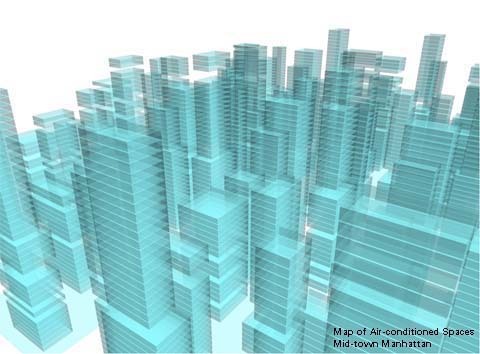 The methodologies, the visual language, and the platform of representation are absorbed into tools currently used to measure traffic, scope out real-estate, and find a restaurant. That is, the system of representation and the thing represented emerge from entirely different concepts of the urban. 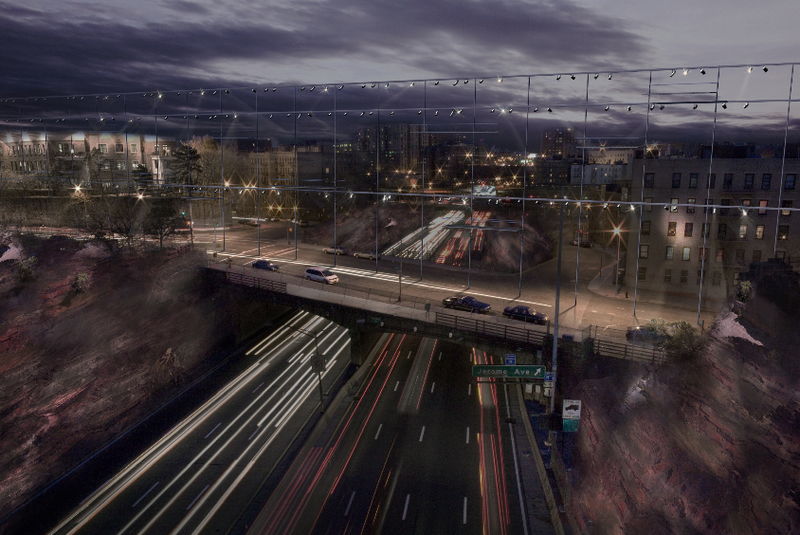 It makes the Lower Manhattan Expressway look so tame! But what makes this so interesting is that the map works. Why? Because google maps and our understanding of Moses hang on the contemporary concept of infrastructure. Like the concept of “nature”, the contemporary term “infrastructure” is becoming one of the most important, but trans–historical terms of our epoch. It appears to describe everything (now and “then”) through one single concept; and that’s a problem. The maps are great, but the social structure that makes it convincing is troubling. 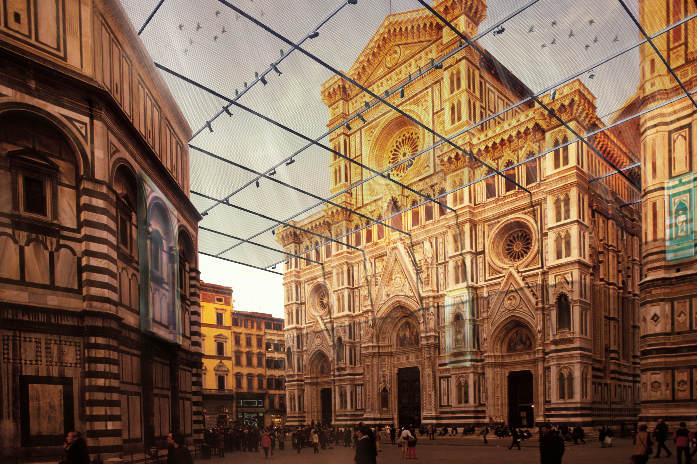 An ongoing obsession here involves the possible links between architecture and geography. 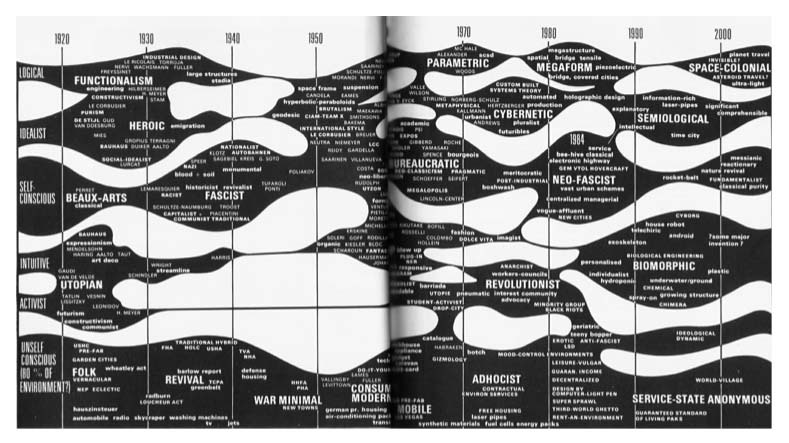 There are so many different ways to think about this: the historical use of geographical thought in architecture, the development of geographical methods for architectural and architectural historical research, the architectural history of geographical exploration, etc. It’s one of my favorite subjects. 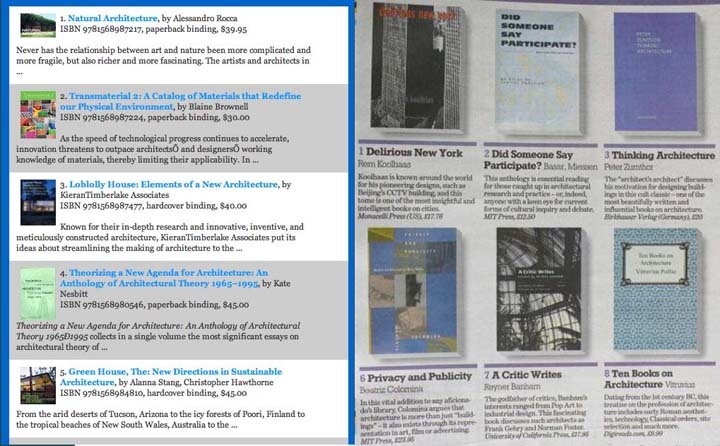 Lately, I have been reconsidering another, more direct and crude application of geographical ideas within architecture — in particular architectural history. I’m interested in the architectural historical appropriation of those structures used by geographers to produce knowledge. I mean “structures” with absolute literalness. 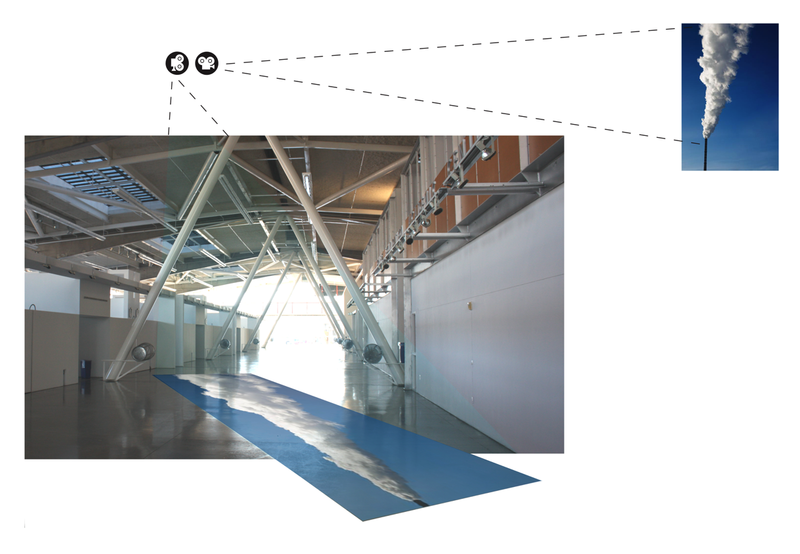 Those deployables, vehicles, and sensing stations that we see in geographical methods of examining the world might be considered by architectural historians to examine the built world. This could be done as an aspect of a normative or more experimental historical technique. When I was working on my phd between the departments of geography and architectural history, I often fantasized about venturing with the geographers (the “real” geographers) who conducted fieldwork in the most extreme environments. 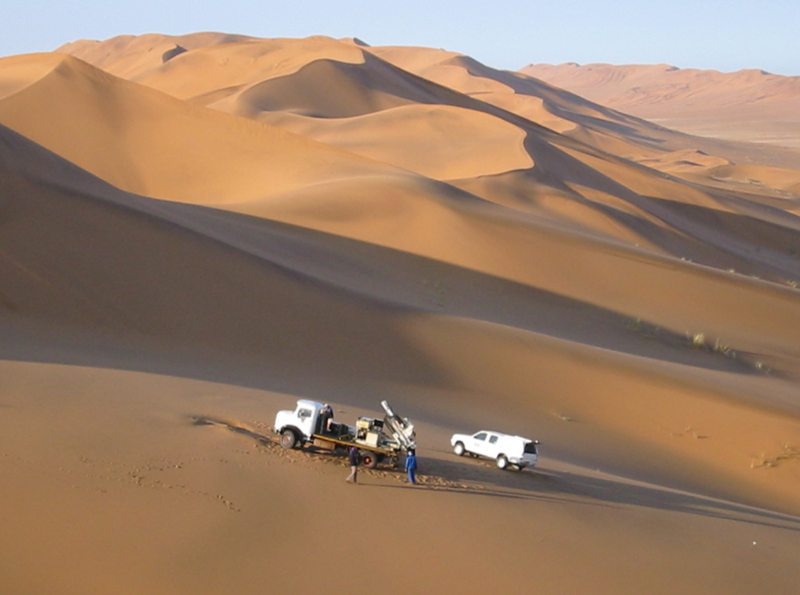 At the department of geography at UCL, I recall one expedition to Chad, in which the geography students of UCL went to the “dustiest place on earth” (that’s the image above) with some interesting field equipment. I have been in a nasty archive or two, but the images in the geography newsletter suggested that these students were in some entirely different situation (and using some cool tools). It was a bit frightening and exciting to imagine the possibilities. This form of “exploration” appears throughout the history of architecture, where it has a long and often troubled history. But I’m not here to berate the explorers; others are far better at that than me. I am interested in considering the possible alterity that might be found in these acts of geographical/architectural curiosity. 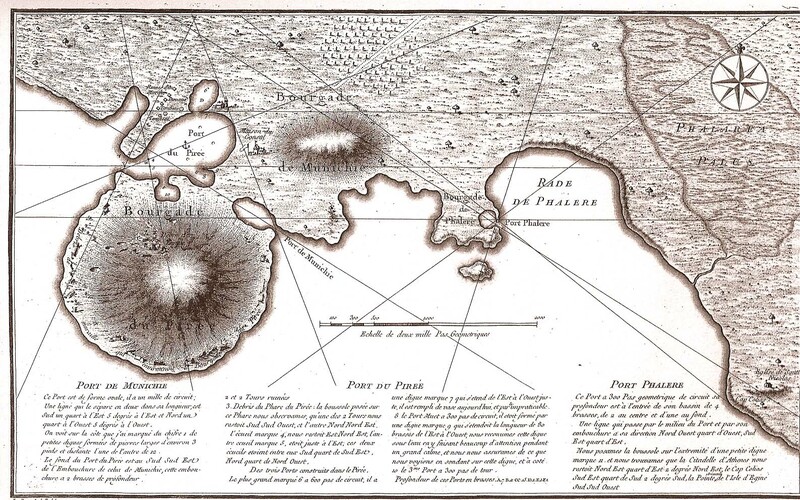 The use of geo-explorative structures, which is part of this larger history, is much less examined. Perhaps it’s there where something new might be found. One of my favorite examples of an architectural appropriation of geo-exploration is the Otranto project by Renzo Piano and Peter Rice. 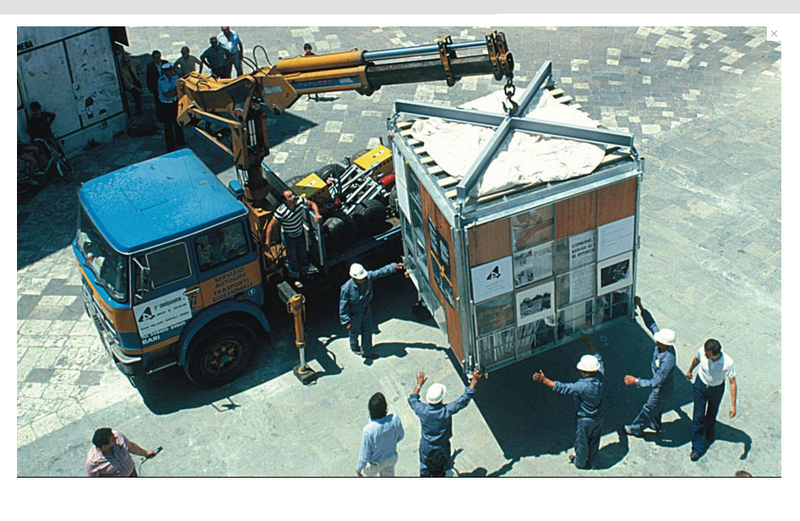 In 1979 Piano and Rice appropriated the imagery of geographical field stations for a Unesco-sponsored workshop on the restoration of Otranto, Italy. Within this deployable station, workshops were held with local residents to consider strategies for renewing this somewhat impoverished Italian town. I still find the project (below) an interesting counterpoint to most contemporary imagery surrounding “community” based, restorative architecture — the latter movement typically embracing a low-tech, folksy and local visual grammar. Here, a community architecture, is understood as something that draws on the technological prowess of a contemporary state. 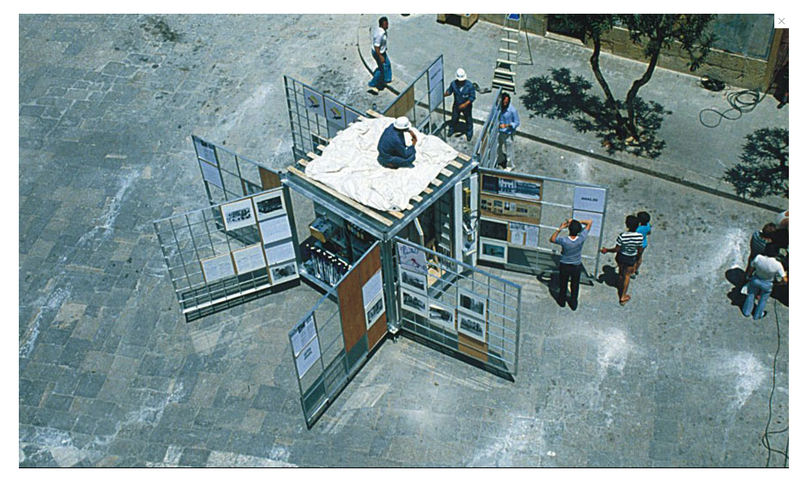 In the 1980s, a different, but equally technological realization of geographical knowledge systems within architecture appeared in the tree raft structure (below) by Gilles Ebersolt. 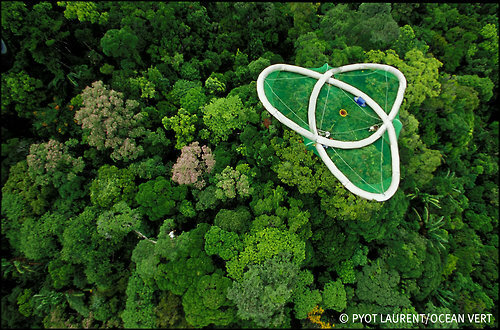 Here, the French architect worked with naturalists and environmental geographers to develop an architecture that enabled scientists to explore the canopies of rain forests. 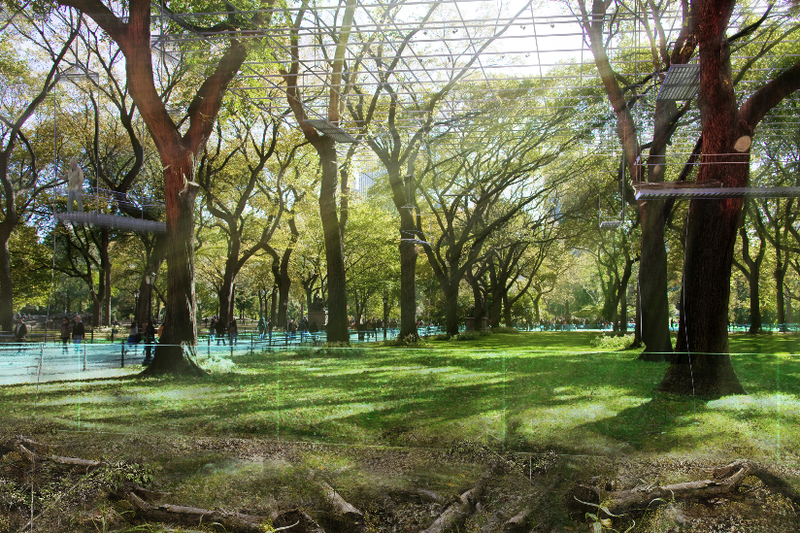 In some projects, Ebersolt developed fantastic research stations for use in urban sites. In enormous inflatable spheres, Ebersolt’s urban explorers move through terrain, appearing with a sometimes troublesome scientific detachment. 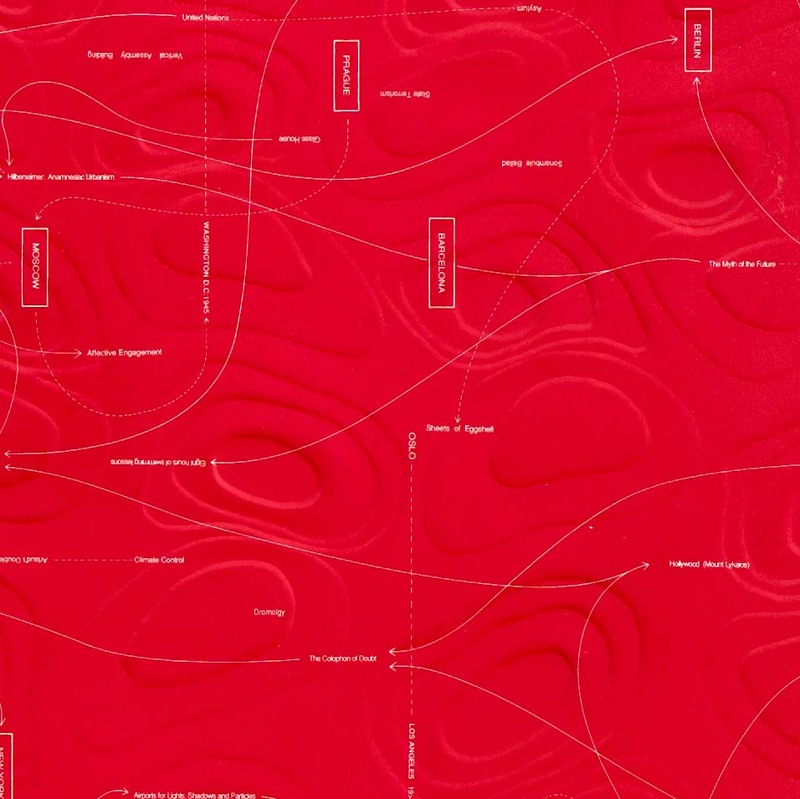 In the past ten years, the architect Laura Kurgan updated the image of geo-knowledge production within architecture, transforming it into something far less instrumental and far more informed by various “critical” turns. 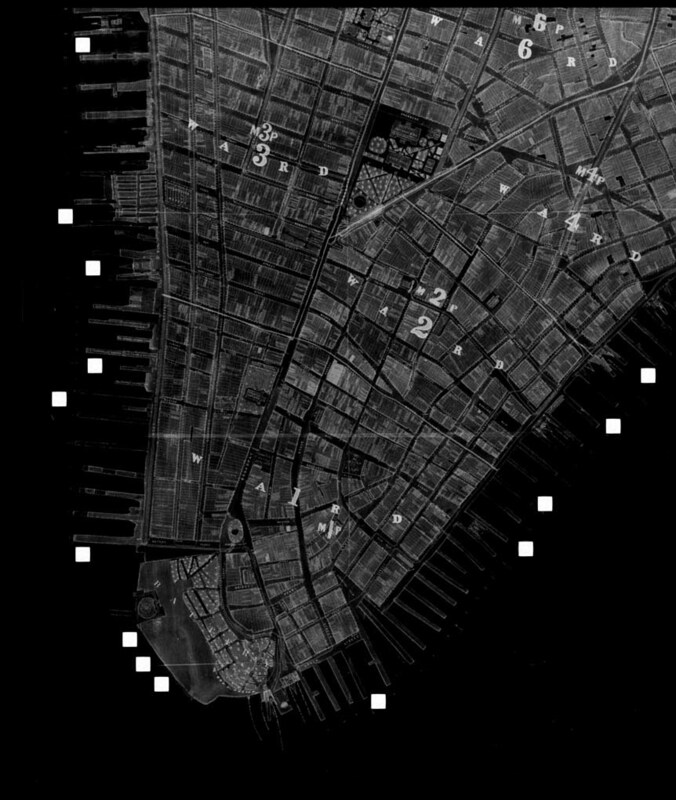 In a recent project that illustrates her interests, Kurgan used imagery from the Ikonos satellite to examine how the attacks of September 11th registered in geographical space/time (below). The project considers how September 11th will be recorded as a historical event due to the particular remote strategies of seeing that pervade contemporary strategies of planetary visualization. The above projects present many interesting possibilities. Among the possible geo-machines yet to be staged within architecture, I continue to consider recent robotic imagery in contemporary experimental architectural practice. Various architects embrace robotic to reconsider architectural program and construction labor, but could we reinterpret the robot image as a form of knowledge production about architecture. This makes particular sense, as robots are already used to examine sites remotely, particularly those inhospitable to direct human observation, and unreachable via satellite (eg. the urban underground and extra-planetary!). I am not sure how such a project would intertwine with additional forms of commentary evident in the work above, particularly the critical directions implicit within Kurgan’s work. Kurgan’s project, and perhaps Piano’s, foreground the techniques of knowledge production in such a way that knowledge and its instruments are open to debate, even as they are put to use. That, to me, is the key in the development of a remote-sensing, geo-architectural historical machine. 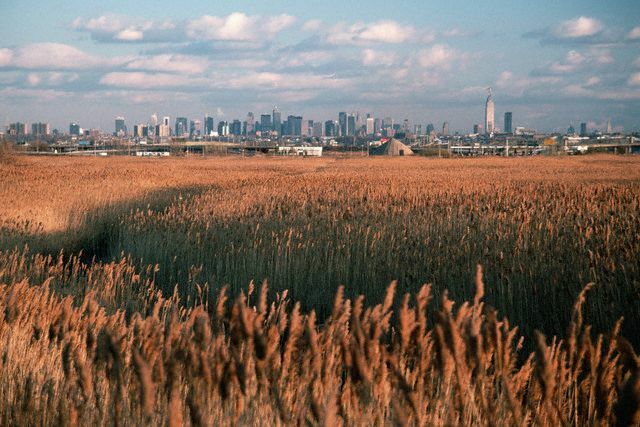 The swamps at the edges of my childhood town in Bergen County, New Jersey were strange zones of muddy flats and reeds that ended in the Manhattan skyline. 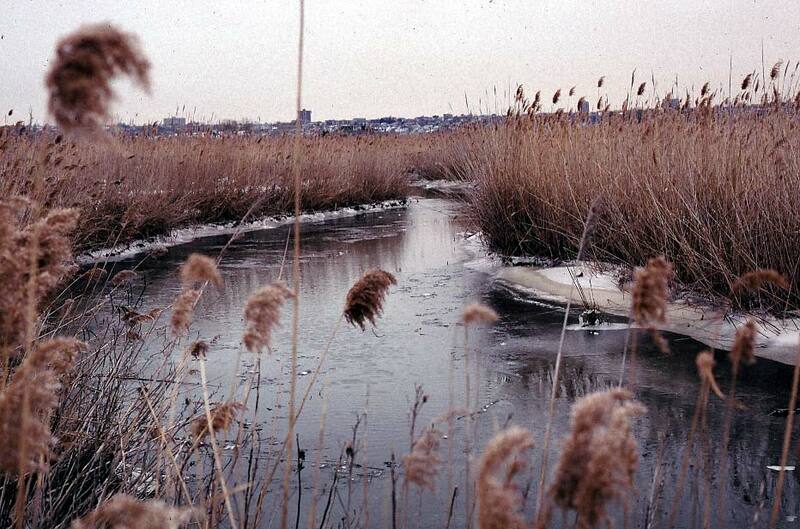 If you grew up in New Jersey and were not that interested in going to the mall, you probably went to the swamps. We “swamp kids” were metal-head teenagers, who thought “fun” involved transforming this landscape by whacking reeds, shoveling out trails and building hills. The swamps were viscous landscapes, where virginity was lost, D-batteries drained (playing awful music on tape decks), and road bikes shot up dusty hills. The swamps were places where the more normative, middle-class trajectory of suburban adolescence was momentarily suspended. It was a space I constantly considered as a kid, but have not thought about in a long time. The swamps of New Jersey never appeared in recent and hilarious representations of New Jersey youth, primarily because they do not fit the narrative role that New Jersey often plays. The swaps were the furthest thing from the “malls” — spaces that typified aspects of New Jersey town life and that are endlessly contrasted to the more urbane Manhattan. The malls of Jersey appear in publications and writings, but the swamps do not. But despite the swamps invisibility, I have come across the swamps again in the most unexpected of places — an art practice, an essay, a film. What I never knew, was that adults also saw the swamps as spaces of transfiguration. Here is Robert Smithson and Nancy Holt’s video “Swamp,” (1971) filmed in the New Jersey swamps of Bergen County. It completely captures the minimal flora and sounds of these landscapes. And Smithson added…”it’s about deliberate obstructions or calculated aimlessness”. 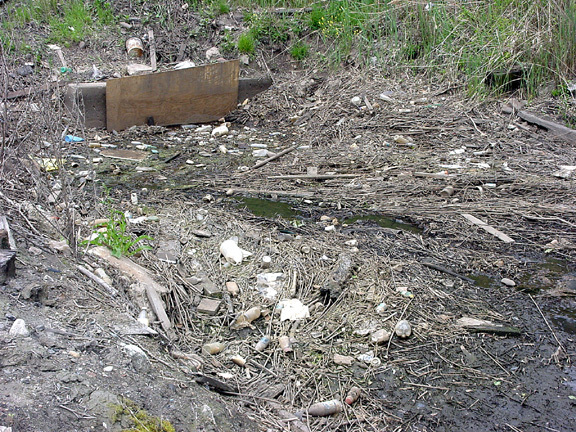 As Smithson and Holt wandered the swamps, the swamps were used as dumping grounds for building debris from Manhattan. As a child, my friends and i could watch trucks roll into the swamps and dump bricks and stones into mounds which we would then climb. It is only recently that I learned that the remains of Pennsylvania Station were dumped here. Architecture history buffs traverse the swamps looking for the remains of this and other famous New York City buildings. 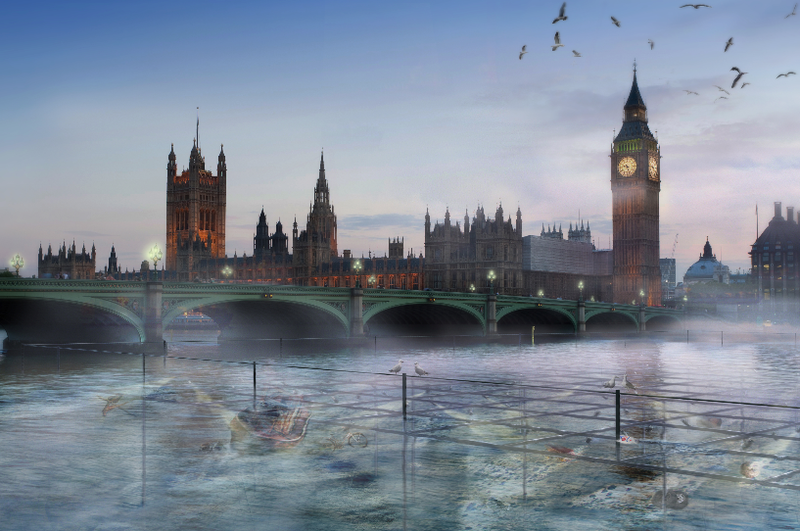 In the past few years, I have come across the swamps again, as an aspect of post-structuralist urban theory. In the opening passages of his essay, “Anxious Landscapes”, the architecture historian Antoine Picon recalls looking out of an airplane on his way into Newark airport and seeing a strange landscape neither wholly natural or human. Picon was viewing the swamps. His perception of the swamps begins this essay on architectural and technological history, concepts of nature, and the production of selfhood. The Anxious Landscape, as he labels it, can be seen in the New Jersey swamps, and in the visions of Piranesi, Boullée, and contemporary films, such as Blade Runner. Within this landscape of anxiety (the swamp and related spaces), Holt, Smithson, the scavengers, and Picon all revel in the momentary disorientation. For Holt, Smithson and Picon, the contemplation (or navigation) of this type of space produces an alternative form of subjectivity. 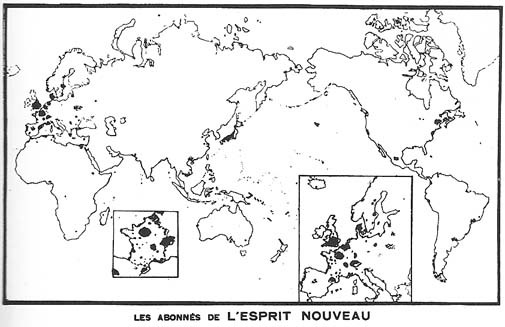 In Smithson and Holt’s video, we witness a type of anti-explorer — a parody of geographical exploration. In Picon’s essay, he also questions how one might navigate or map the anxious landscape without a corresponding transformation in the viewing subject. This is a form of landscape that demands a certain transformation in those that move through it. I suppose that was how I used the swamp, as a landscape in which to get a bit lost and to try to become something different. We are wrapping up the (hopefully) final version of the proposed plume/idling installation. The project is a reconstruction of an exhaust plume from the busses once inside the original SOM bus shed that is now the California College of the Arts (where I teach). The latest version of this project (above) involves filming one of the last functioning industrial stacks in this part of San Francisco and simply projecting that footage on the floor of the SOM building. The slight distortion will make it appear akin to exhaust from automobiles. The reason I decided to do this is that it enables us to understand how we experience pollution (or the lack of it) and urban change in tandem. The smokestack is in a part of this larger precinct of the city that is not as rich, but that is experiencing the pressures of neighborhood transformation (what, in an earlier time, we could simply call “gentrification”). Like the former exhaust plumes from busses in the, now, more posh side of town, the smoke plume may eventually disappear in the name of urban and economic health. All of this suggests something, not yet fully developed, for new protocols within histories of architecture — the historian (or anyone interested in historical reconstruction) might be understood as a manipulator of space/time. There are, of course, significant histories of the idea of space/time in architecture; but there aren’t many acts of history that attempt to manipulate the experience of space/time relation itself. Philippe Rahm’s Climate Ucornia is one of the few I know. I am writing about this because the above project excites me, but also because there has been an interesting discussion here and elsewhere (and here too) regarding the historian’s working relationship to time. Within which, of our concepts of time, should the historian’s efforts be situated — past, present, future? The above project intrigues me, as it suggests that these may not be so easily parsed or fixed.